It seemed as though I had stepped back in time to my days as apprentice geisha. My onesan as directing a show and I was preparing to perform. It was different in that we were wearing the attire of Manchu princesses of China’s Qing Dynasty, and I was not a member of an okiya. However, I enjoyed meeting the girls of the Nakanoshima Okiya and Pear Garden group for this great show. 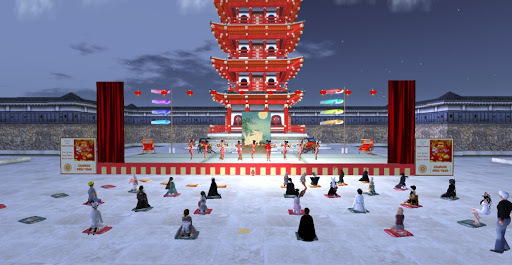 I was late to join the performers, so a special rehearsed was held for me to tell a story that had already been prepared for me, the Zodiac Jade Emperor Tale. As with all the works prepared by my onesan, it was beautifully written and I was able to tell the tale with ease. I dance with a couple girls as I told my tale and Masumi san studied my delivery. When the tale was completed, I was surprised that my onesan, always a stickler for detail, approved of my delivery without further comment, and our rehearsal ended. On Sunday, performers and dancers arrived early and took their positions behind the massive curtain on the stage in the Hosoi Ichiba market area. I was somewhat nervous but when the Empress of all these regions arrived and greeted me personally, she assured me I’d do fine and I found myself more at ease. Patrons arrived, including my Takamatsu, but because more were expected, Masumi san didn’t not begin the show for a few more minutes. Then the music began, the curtains opened and the nine ladies of our show began dancing in perfect synchronization. The curtains pulled back revealing the colorful, festive decorations and the celebration began with the music of the Prelude to Spring Festival. 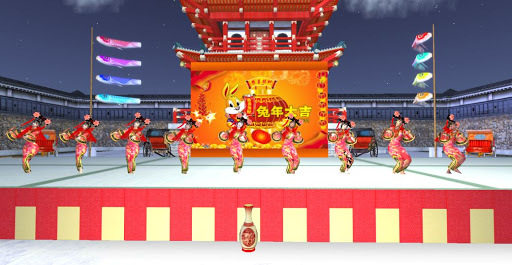 Masumi san stood in the center of eight other dancers, and she greeted our patrons. The moments became long as I awaited my queue to perform. Despite my earlier calm, I was not very apprehensive but then I got my queue and began. What a relief I felt as I said the first lines. 1 Tonight I will tell you all the story of the Chinese Zodiac. 2 There are several legends about how the animals were chosen for the Chinese zodiac. Here is one of them. 3 Long ago, in China, the Jade Emperor, Emperor of heaven, decided there should be a way of measuring time. 4 On his birthday he told the animals that there was to be a swimming race. 5 The first 12 animals across the fast flowing river would be the winners & they would each have a year of the zodiac named after them. 6 All the animals lined up along the river bank. And of course, there is much more to this story, but for now I will finish telling you about our show. 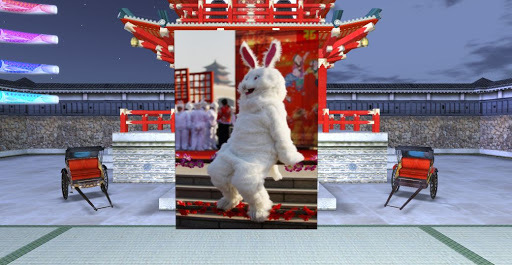 Throughout the show the stage hands would put up giant pictures of the guest of honor, the loveable bunny. Following me, Masumi san introduced the lovely Josiane, who told us about the wonderful rabbit and that “A person born in the year of the Rabbit possesses one of the most fortunate of the 12 animal signs.” And following Josiane, Masumi san resumed her narration, telling us of the countless superstitions & customs for the Chinese New Year then introducing Toshisuzu who told us of the great history and traditional activities of Chinese New Year. As Toshisuzu told her story, we danced to the music with growing expectations of the finale that would come shortly. And the stories ended and Masumi san announced that it was time for the fireworks to begin. All of a sudden the night erupted with a beautiful display of fireworks. As we danced the explosions of sounds and light filled the night with excitement. When the fireworks ended, my sister performers and I bowed to the audience. I was very proud of my onesan for producing yet another great show and proud of my sisters for their wonderful performances. I was also proud that my Taka was in the audience applauding us. More than anything it was Taka’s joy that filled me. 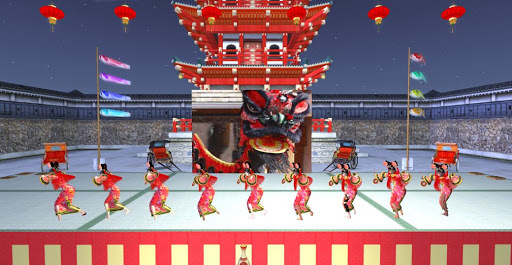 This entry was posted in Writing and tagged Adventure, Events, Geisha & Samurai, Photography, Second Life, Stories, Writing. Bookmark the permalink.